The nearest point map of a real algebraic variety with respect to Euclidean distance is an algebraic function. For instance, for varieties of low-rank matrices, the Eckart–Young Theorem states that this map is given by the singular value decomposition. This article develops a theory of such nearest point maps from the perspective of computational algebraic geometry. The Euclidean distance degree of a variety is the number of critical points of the squared distance to a general point outside the variety. Focusing on varieties seen in applications, we present numerous tools for exact computations. Jan Draisma was supported by a Vidi Grant from the Netherlands Organisation for Scientific Research (NWO), and Emil Horobeţ by the NWO Free Competition Grant Tensors of bounded rank. Giorgio Ottaviani is member of GNSAGA-INDAM. Bernd Sturmfels was supported by the NSF (DMS-0968882), DARPA (HR0011-12-1-0011), and the Max-Planck Institute für Mathematik in Bonn, Germany. Rekha Thomas was supported by the NSF (DMS-1115293). J. Draisma and E. Horobeţ: The average number of critical rank-one approximations to a tensor, arxiv:1408.3507. 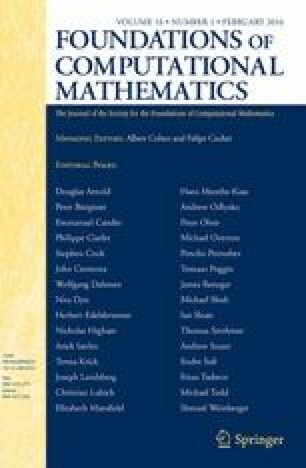 S. Friedland and G. Ottaviani: The number of singular vector tuples and uniqueness of best rank one approximation of tensors, Found. Comput. Math., doi: 10.1007/s10208-014-9194-z. D. Grayson and M. Stillman: Macaulay2, a software system for research in algebraic geometry, available at www.math.uiuc.edu/Macaulay2/. D. Grayson, M. Stillman, S. Strømme, D. Eisenbud, and C. Crissman: Schubert2, computations of characteristic classes for varieties without equations, available at www.math.uiuc.edu/Macaulay2/. A. Josse and F. Pène: On the normal class of curves and surfaces, arXiv:1402.7266. The Online Encyclopedia of Integer Sequences, http://oeis.org/. G. Salmon: A Treatise on the Higher Plane Curves, Dublin, 1879, available on the web at http://archive.org/details/117724690.